Our next VISIONS Across America trip is really shaping up to be a tour of college campuses in the Deep South. We’ll be in Orangeburg, S.C., home of South Carolina State University; Auburn, Ala., home of Auburn University; Tuskegee, Ala., home of Tuskegee University; Birmingham, Ala., home of the University of Alabama at Birmingham; and Oxford, Miss., home of the University of Mississippi, better known as Ole Miss (above). 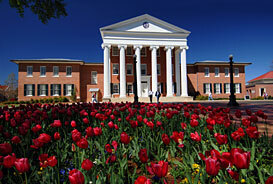 I am looking forward to seeing some seriously beautiful college campuses! The photos I’ve seen online show lovely, traditional southern architecture on each of these campuses, and we should be there when flowering trees are in bloom, so it should be a very pretty time to visit. Besides these traditional college towns, we’ll also be visiting alumni in the cities of Atlanta, Ga., and Memphis, Tenn. It looks like we’ll be visiting no fewer than nine alumni in these five states — and I’m hoping to be able to add a couple more in the weeks before we hit the road.